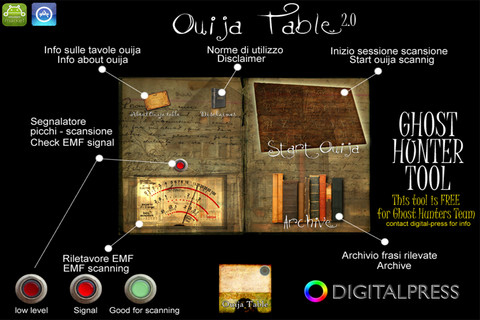 Ouija Table iPhone App Review. 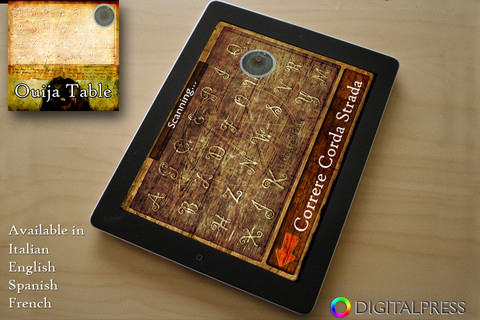 Once in a while, we're asked to review an app that simply seems too far-fetched to work. Granted, I am always the skeptical one and I question everything. So when I read something like "you must believe in order for this to work," my rational self takes over. Perhaps thereafter I cannot objectively assess the app in question. This was the case with Ouija Board. And this is the trip down ghost-bustin' lane that I had undertaken, accompanied only by my trusty iPad and Ouija Board from the AppStore. I read the developer's description of the app in the AppStore. Although it gave that sort of if-it-doesn't-work-it's-your-own-damn-fault feeling, I decided to pursue and carefully jot down my observations. The living room was dark, with the drapes blocking most of the pale rays coming from the autumn sun at its peak. The mood was just right, on the coffee-table, in front of me, right next to the iPad, was a jasmine-scented candle giving a faint light bright-enough just to see the edges of the table. Aside from the occasional footsteps of my upstairs neighbour walking around in high-heel shoes (I must remember to ask her why on Earth she walks on high-heels inside her apartment), the silence was deafening. When I could hear myself breathing and could barely see my hands in front of me, I knew I had the right athmosphere. I downloaded the app from the AppStore and all I had to do was Start Ouija. True enough, the little lens started moving around the letters. A couple of times I even felt that cold chill down my spine when it paused on a letter for too long. But alas, it did not stop. The lens was trying its best to keep my bloodpressure up. The suspense was killing me. Seeing the little lens moving all around the board, as if possessed, was more than I could take. Why don't you tell me what you want already I almost shouted. But I was afraid I'd wake up my black cat sleeping away on her soft pillow. A whisper will do for now. Why don't you tell me what you want already I said in a low whisper. There was no answer. Not even from the Ouija Board. Not even from my cat. Casper (yes, that's my black cat's name) was purring away on her pillow without a care in the world. Cats are said to have a sixth sense. They're the first to realize there's an earthquake. I half-expected my Casper to also let me know if there's a supernatural presence about. But Casper said nothing. The Ouija Board app said nothing. My chills were getting more frequent. It had gotten quite cold in my dark room. I swear I could almost see puffs of warm air coming out of my nostrils. It was then I realized I had turned off the heat in an effort to draw the spirits closer. I walked over to the furnace and turned it on. It gave a quick shriek and a quick spark of light warned me that it had indeed turned on. The lens kept moving and moving. Round and round. There was no end in sight. Whenever I thought the lens had decided on a letter, I would give out a quick silent wail, but not long after, when the lens moved again, a sigh undoubtedly followed. After what seemed like an eternity, the scented candle gave its last breath of light. I carefully pulled the drapes open. I looked again at the iPad. The Ouija Board app was still moving that lens. But in the end, I decided to put an end to this facade and recount the events of the last half a day of my life (suprinsingly enough, it was only 42 minutes). THE RESULTS ARE IS A FACTOR IN WHOLE UNCONTROLLABLE WE DO NOT GUARANTEE ANY PARTICULAR RESULT FROM THE USE APP OR ACCURACY OF THE PHRASES OR SENTENCES OF THE SENSE OF. Apart from the obvious bad English, the developer actually says that his app may not actually work as expected. 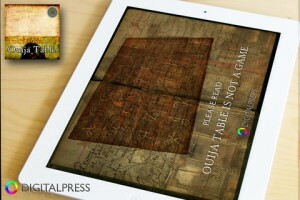 I must wonder, did the Apple Review team find ghosts since they approved this app? Can we know if the ghost hinted at the next iPhone and quite possibly a better version of iOS maps? However, this review is to be taken lightly. I'm a skeptic, don't believe in these things and the fact that the app didn't work for me (the non-believer), doesn't mean it won't work for you. But if I were you, I'd ask the developer for my money back if no ghosts will walk amongst you. What do you think of Ouija Table? Scroll down for our comment section and let us know! Awesome! So you also went the Disqus way! I personally have never looked back after installing it on Techknots.